The first single from the forthcoming album 'Bird Head Son', including "Vero" (feat. Keziah Jones on guitar and backing vocals), "Robberman" and "Poverty is Hell", a cover of a Trini soca classic by The Mighty Shadow, exclusive to this release and done in the inimitable Spasm way. 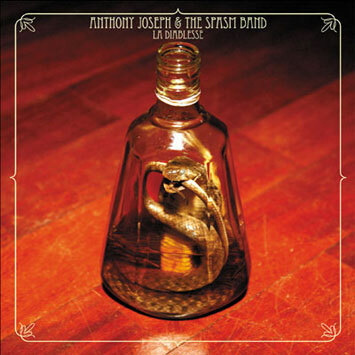 Anthony Joseph and the Spasm Band's new album will be released in fall 2008 but you will get a taste of their amazing new sounds at the end of this month with the release of their new 12" untitled 'La Diablesse'. Recorded last march with the contributions of Keziah Jones, Joe Bowie (Defunkt) and vibist David Neerman on some tracks, the band expands its deep carib 'free' jazz sound unto a new fascinating voodoo funk trance. The band have created exciting new songs that will shake the spirits and make the body moves. Anthony's sublime poetry is now complemented by a strong dose of inspired singing that send his vocal art far beyond so called spoken-word. Andrew John's hypnotic basslines, Paul Brett and Paul Zimmerman's fiery percussive grooves and Colin Webster's ecstatic sax choruses are now joined by Adrian Owusu's funky guitar licks and Craig 'Cigar' Tamlin's percussion skills to create new coulourfull rhythms and melodies. The whole album was recorded in the great Studio de Meudon near Paris like the other Heavenly Sweetness recent productions and I've taken a great care in respecting and 'enhancing' the spiritual nature of their Music. The whole album (and plenty extra tracks) has been recorded over 2 days in an altered state of consciousness on collective takes with very little over-dubbing. Chicha Libre - iSonido Amazonico!